Much has been written about the transformative experience that motherhood is. The change is both internal and external - from how we feel to what we look like. The archives of this blog have many examples of such confessions and outbursts. Some have been made in reflection, others in utter frustration. But what about the social transformation that a mother goes through, or rather, is put through? Let me explain. For me, becoming a mother coincided with settling away from home in a new country. As my life changed completely (and beautifully), I realised that I just could not be the friend I was earlier. I couldn't keep up with what everyone was doing, or ring them up just like that. Anyone who has spent time with a newborn knows how the days converge into each other until you don't know whether it's dawn or dusk! It was not about the physical distance, but a mental gulf that was forming between me and the people who were friends and acquaintances. I began to feel like I was inhabiting another planet, one with just me and my baby. The rest of the world was elsewhere. I understand now that most of my friends simply couldn't relate to the parenting experience because they didn't know what it was like. It's one of those things that you simply cannot explain to someone in words. Over time, I realised that I was expected to be what people knew me as earlier - but here's the realisation I came to: I couldn't be that person anymore. The carefree days were gone. I had so much to think about, so much to worry about. There was no way I could answer every phone call, or remember every birthday, or attend every social event. More than not being able to, I didn't want to. I didn't want to take my eyes away from Little Dude's smiles, and I just wanted to hold him close. I just wanted to scream out loud: This is the new me, so just accept it! I don't want to apologise for giving up my past life, because the bottom line is that I am happy. It may not be somebody else's idea of happy, but it defines me. I don't think I have made any sacrifices by not going back to work or giving up some things I used to do (such as watch movies at the cinema). I have simply made a choice of what kind of person I want to be now that I'm a mother. To an extent, I think every new mother goes through this process of fracturing and creating social bonds. Why are mothers expected to just give birth and then move on with their lives - looking fantastic and getting back to whatever they were doing? I respect all working moms, but I also know that it's doubly hard on them to focus on their career and take care of their kids. What I'm trying to say is that moms shouldn't be made to feel that they have to be perfect in every way. We have a right to make the choices we want, change our lifestyles, or give up on a few things for the sake of our children, or simply because we can't keep up. Parenting is hard as it is, so expecting mothers to live up to an exaggerated social life is just not acceptable. I know there are a few supermoms who manage to do everything, but even they rely on some help. But for the rest of us, even getting out of the house on schedule is a big task. Every little thing that a mother does, be it the laundry or cooking, goes a long way in making a happy family. So, if all I have to talk about is my toddler's sleep or eating habits, it's because right now that's most important thing to me. That's me as am I am now. 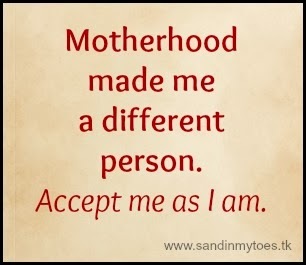 Motherhood really is a transformational experience! Glad you could relate, Janine. I'm happy to be co-hosting today! There is no doubt that motherhood changes you. In some cases, hopefully most, it is for the better. Some people from you "past life" make it through the porthole and take the journey with you. Others become a memory. Sad as that may be, it's a trade off that is so well worth it. Shout it from the rooftops! I kept nodding my head over and over again as I was reading this post, Tarana. You put all those feelings that I was going through when I first became a mum myself into words so eloquently. I was still a uni student when I had my first child, so i was definitely on a different page to the majority of my friends at the time. I felt like I had to be everything to everyone back then and stretch myself in so many different directions to make everyone happy. In retrospect, I wish I just ignored what everyone else thought, the way I did the second time I had a baby, 8 years later. I think the entire concept of a 'supermum' is ridiculous and puts far too much pressure on mothers. Great post! Perfectly said as always, Sandy! Thanks for sharing your perspective, Lizzy. the pressure is especially harder when you're younger, so I can imagine how it was for you. If I do have another child, I know I'll worry even less about these things. What a lovely post. Motherhood has changed me in so many ways and I continue to evolve as a parent as my kids grow and hit new stages. As mothers, we all need to be a little kinder to one another. You never really know what is going on in someone else's life or home. Just what I needed to hear on a Friday. Thanks! Great post! Life changes are hard, due in part to the fact that they always come packaged with the end of something. Motherhood brings all these wonderful new gifts but you have to say goodbye to old ways of doing things. And sometimes it means saying goodbye to old friends, too. YES, this!! All of my mom friends were in another state when I had my son. It was so hard to find new mom friends, and the friends who were childless here didn't understand why I had to say no to so many lunch dates (because naptime is so much more important!!!). Really really love this. Motherhood changes us in so many ways - many of which I'd never have expected. Very well said. I found myself agreeing with you at almost every sentence. Motherhood changed my life, for sure....but I wouldn't have it any other way! Motherhood is definitely a transformational experience; indeed, I just wrote a post (scheduled for next week) about it as well. I appreciate you pointing out the social transformation, which I think gets a lot less attention. I am still struggling because many of my friends don't have children yet, and it's making it tougher and tougher to relate. The truth is that my life is different now because I am a different person now - and that's not a bad thing! You're right - you have to give up something whenever there are major life changes! I know exactly what you mean. It's even harder making new friends after becoming a mom, especially when you have a baby. So you can relate to this! I feel like I'm the only one having a hard time finding the 'right' mom friend. I'm really relieved by your comment and all the other moms who agree. Looks like this is one aspect of motherhood we don't talk about much! You've understood exactly what I mean. Looking forward to your post! So happy to have you as a co-host this week, and what a fantastic post today! I really related to this one, as I'm sure many moms will. I especially appreciated your line about all mothers going through the process of fracturing and creating new social bonds- that is so true! It was hard for me to relate to some of my friends without kids, and sometimes still is. I often feel like a disappointment to them because of my social limitations. A huge HOLLA!!! to mothers not feeling like they have to be perfect and still keep up with everything like they did pre-kids. Oh I love this. I love those last two sentences. We're expected to be the person other people want us to be when our interests and priorities aren't what they used to be. I really enjoyed this. Thanks for co-hosting! And again, sorry I forgot to send you the link code. Good point, Chris! I do have a few gems of friends who would welcome me anytime. You've said it exactly as it is - that disconnect with some friends can be awkward. This was interesting to me because most of my friends have had kids and my husband and I haven't been able to. I think I've probably been a little insensitive to their changing lives out of jealousy. This was a great topic for the week, Tarana - thanks for coming up with it! Becoming a parent is certainly a life-altering event - how can we not change? Fortunately for me, the friends that I had pre-kids accept me for who I am as a mom and an adult, even thoug the Dana they knew back then was much different. Thank you, Dana! I'm so happy to hear that you have such understanding friends. Everyone's been through this phase, Tasneem. We shouldn't let it bog us down. Yes, I found having children before my friends put me in such a different place, emotionally. You put it all so well here. I'm happy where I am and what I've chosen for my life. As friends, you just hope they understand. becoming a mom/parent brings in so many challenges esp if that is your first one. I can relate to the above. I agree. The highlight of my day and what sum's up my whole being this very moment are my kids. We might need to go out once in a while to freshen up, during the time we are not around our kids we miss every bit of mess and whine they make. That's the point, Brittnei. Society should be accepting of every mom who is doing the best for her child. It's a good thing your family is understanding! Thanks April, glad you could relate! I'm with you, Abigail. That's how I feel too! Perhaps because I was late becoming a mother I didn’t have a huge challenge with people’s expectations of me - at least with regard to socialising and so on. Most of my friends already had kids, and sometimes the biggest challenge was all the unwanted advice I got! Two of my closest friends weren’t mothers, but both wanted kids and were pleased to join in with my family, so it was never an issue. However, I can definitely relate to the challenges of moving just as you became a mother. I did that too, not to another country, but several hundred miles. It was not easy trying to make new friends and in 3 years I did not make any lasting friendships. It had been our third move in less than 2 years so I although we moved back to where we’d been immediately before, I didn’t even have many established friendships there. Thankfully we haven’t moved since, so I do have friends now! I totally agree with you that mothers shouldn’t be made to feel that they are doing something wrong and need acceptance just as we are. Thanks for sharing this, Yvonne. I was among the first of my friends and colleagues to get married (though I didn't marry at an early age), so there was a disconnect. I guess I take longer to establish friendships, so it may take me a while to make some where I am now! So true - I had my eldest daughter in France when I was 30 and it was such a confusing time; in France most mums go back to work when their babies are 3-4 months old, and they are expected to be "women" again and not "mums", all of which I found really hard. Also turning 30 and becoming a mum meant I wasn't sure who I was anymore, it took me a long time to figure it all out (I'm 38 now). Sadly some friends just don't get it when we change because of motherhood. It can be a confusing time, really, especially when your relationships with friends change. Thank you! It was easy to develop this attitude, but I guess every new mother goes through this learning curve. Thanks, Sara! It can be tough to maintain that balance between protecting our individual identities, and what we become as moms. Sometimes, even the moms judge each other, which is unfortunate. I love this perspective! There is so much joy in being present in this season of life to see the joy in the little moments. Great thoughts!